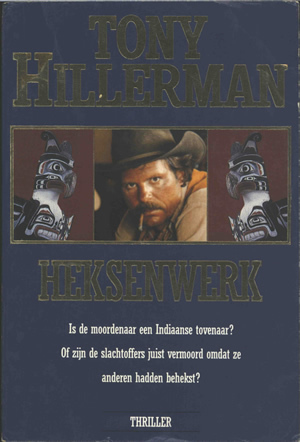 This Dutch paperback edition of Skinwalkers was published in 1991 by BZZTôH in The Hague, Netherlands. The paper cover has a navy blue background. On the front cover, the author's name and the book title are lettered in gold above and below a gold-bordered photomontage. The left and right photos in the montage depict the same carving, facing both left and right, similar to the totem poles created by Pacific Northwest indigenous people. The central image is probably meant to represent a "cowboy," a man of European heritage wearing a dark brown Western-style hat and beige canvas coat, with a sun-reddened complexion, medium-length brown hair, a mustache, and a cigarette between his lips. At the bottom of the cover, in white, is printed a teaser for the novel and the word "THRILLER." The back cover displays "TONY HILLERMAN" in large, orange-yellow type, and a synopsis of the novel printed in white. Praise for Tony Hillerman from The New York Times is printed near the bottom in orange-yellow, to the right of the bar code. On the spine is printed horizontally the author name in orange-yellow, the novel title in white, and the publisher's colophon in white. The inside front and inside back covers are blank.